Somewhat belated, but here is the the set list for the show played by The Viper and His Second String as part of the Friday, May 21, after party for the conference of the Alliance of Graduate Employee Locals (AGEL) held at the the Italian Workmen’s Club on Regent Street in Madison, Wisconsin. The setting rocked (Lavoratori di tutto il mondo, ridete! ), the Indian catering and New Glarus Spotted Cow on tap was sweet, and I’d like to especially thank the AGEL’s Oregon contingent for treating me to a shot of whiskey at the Greenbush Bar downstairs. Photograph by Heidi Lynn Lawson. 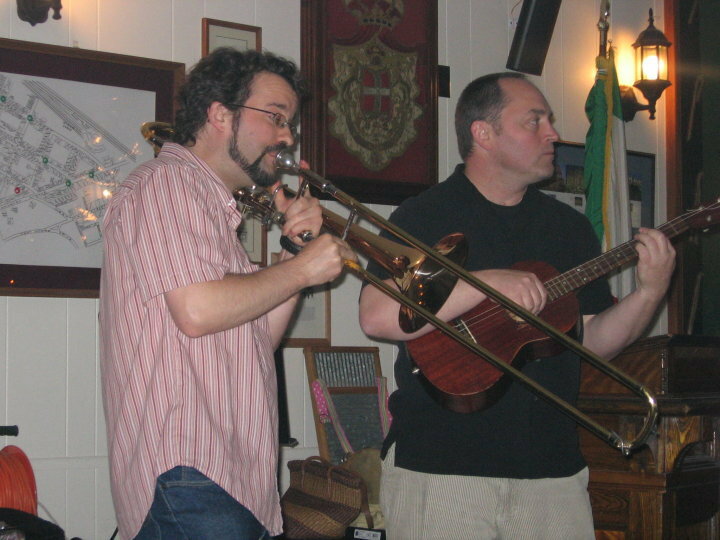 For this show, The Viper and His Second String was a duo, just me and UW-Madison TAA stalwart Rob Henn on trombone, jug, and washtub bass/drum. It was Rob’s first time on two out of those three instruments, and he proved to be a mother-loving master on them. We finished our set up with three wobblyesque unionizing anthems that we played along with the evening’s second band, featuring guitarist/cümbüşjü Charles Hughes, singer Ari Eisenberg, and guitarist Dave Gilbert (?). I wish I could have joined you! Though, mostly for the Spotted Cow.